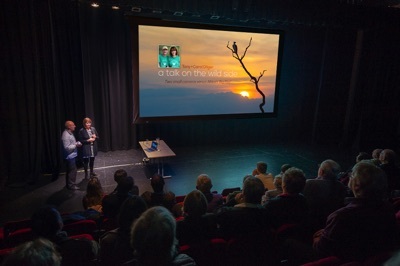 Our multimedia talks are very popular with clubs, groups and societies. Designed to entertain, they combine anecdotal stories with stunning photography, interwoven with music. We reveal the natural history of our subjects, as well as the creative thinking behind the resultant images. Check out this short film about our wandering, nomadic lifestyle: A Wild Life on the Road. A magical journey to Scotland’s ultimate locations. 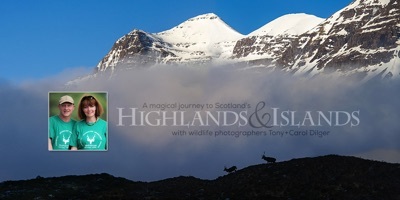 Tony & Carol explore the spectacular Cairngorm and Western Highlands before venturing north to the remote Shetland and Orkney Islands, where they find that where the land confronts the sea, it’s not just the scenery that’s dramatic. Two small cameras versus Africa's 'Big Five'. Tony and Carol take on the challenge of photographing some of the most iconic species on the planet. 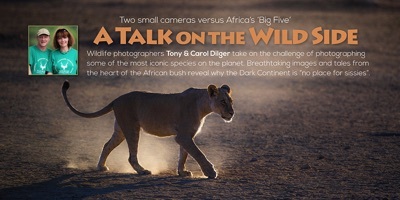 Breath-taking images and tales from the heart of the African bush reveal why the Dark Continent is "no place for sissies". within the UK and don't require accommodation as we have a motorhome. For more information, please email.